Boston returns to normal as bombing suspect Dzhokhar Tsarnaev is charged. We have capped this explainer. Major developments will be covered on our main political blog. UPDATE 36: Monday, April 22, 1:59 p.m. EDT: Dzhokhar Tsarnaev is charged with conspiring to use a weapon of mass destruction against people and property resulting in death. UPDATE 35: Monday, April 22, 1:26 p.m. EDT: Multiple sources are reporting that Boston Marathon bombing suspect Dzhokhar Tsarnaev was arraigned at his hospital bed, and that the complaint against him was sealed. UPDATE 34: Saturday, April 20, 1:01 p.m. EDT: Dzhokhar Tsarnaev is in a heavily guarded hospital room at Beth Israel Deaconess Medical Center. As press attention turns to deciphering the bombers’ motives and the coming trial, Josh Gerstein of Politico has written a piece explaining some legal issues surrounding the case, including the pre-trial interrogation rules facing federal prosecutors and whether Tsarnaev may face the death penalty; Slate‘s Emily Bazelon explains the history and law behind the “public safety exemption” to the Miranda rules under which Tsarnaev is being questioned. UPDATE 33: Friday, April 19, 11:12 p.m. EDT: BarstoolSports.com has posted dramatic amateur video of a pitched fire fight, said to be a recording of police closing in on Tsarnaev’s boat hiding place on Friday evening. And a photo has surfaced that appears to show law enforcement officials administering medical care to the suspect shortly after his arrest. UPDATE 32: Friday, April 19, 10:34 p.m. EDT: Tsarnaev was not given a Miranda warning because of the “public-safety exemption in cases of national security and potential charges involving acts of terrorism,” United States Attorney Carmen Ortiz said. But the Obama administration is emphatic about giving Tsarnaev a civilian trial, according to NBC correspondent Pete Williams. UPDATE 31: Friday, April 19, 10:14 p.m. EDT: Following a press conference held by Mass. Governor Deval Patrick and law enforcement, President Obama delivered a statement addressing the capture of Tsarnaev, the tragedy in Boston, and also the explosion at the West, Texas fertilizer plant on Wednesday. “All in all, this has been a tough week, but we have seen the character of our country,” Obama said. Here’s the video and a link to the full statement. UPDATE 30: Friday, April 19, 10:00 p.m. EDT: According to the Boston Police Department, Dzhokhar Tsarnaev is in serious condition. He was taken to Massachusetts General Hospital. 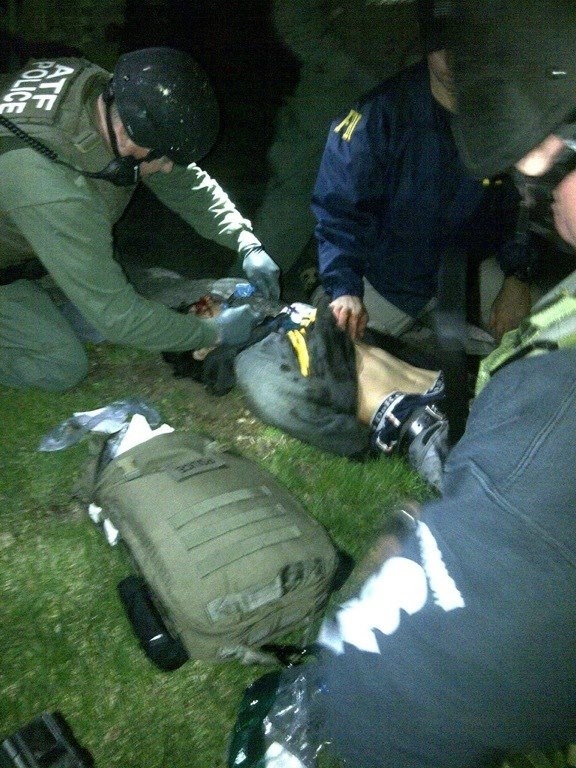 UPDATE 28: Friday, April 19, 8:45 p.m. EDT: Dzhokhar Tsarnaev has been taken into custody. He was found hiding in a boat resting on a trailer in a Watertown backyard. UPDATE 27: Friday, April 19, 7:15 p.m. EDT: Moments after law enforcement officials lifted the city’s lockdown, an exchange of gunfire was heard in Watertown. The Boston Globe and local television are now reporting that police have cornered a suspect. UPDATE 24: Friday, April 19, 12:45 p.m. EDT: Massachusetts Gov. Deval Patrick just held a press conference in which he urged Bostonians to stay in their homes, and warned that the crime scene may go through the weekend. update: Mother Jones has a story on what these Tweets tell us about Dzhokhar Tsarnaev. The Tweets include statements about Islam, observations on pop culture, and trash-talk about women. UPDATE 20: Friday, April 19, 12:00 p.m. EDT: BuzzFeed reports that the Chechen president, Ramzan Kadyrov, has released a statement on the bombings, blaming the suspects’ American upbringing. Beth Israel Deaconess Medical Center received an unknown male patient with significant injuries at 1:20 this morning. After he arrived, he suffered a trauma arrest and expired at 1:35 a.m.
We have no information on the identity of the patient and cannot speculate on whether he has any connection to any criminal activity. Nor are we prepared to speak to the exact nature of his injuries. Beth Israel Deaconess Medical Center is open for business. But we will be restricting access to some entrances to ensure the safety of our patients, staff and visitors. UPDATE 19: Friday, April 19, 11:50 a.m. EDT: The Boston Police Department is reporting that the vehicle associated with the armed carjacking by the two suspects in Cambridge has been located. Former classmates react to the news: “I cant believe i went through 4 years of high school and was friends with someone who carried out a terrorist attack,” one wrote on Facebook. State Police: Suspect abandoned carand is believed to have fled on foot. UPDATE 14: Friday, April 19, 11:05 a.m. EDT: A spokesman for the University of Massachusetts-Dartmouth stated that a suspect in the Boston Marathon bombing is “a registered student on campus.” The university has announced that the campus will be closed today and evacuated. UPDATE 13: Friday, April 19, 10:37 a.m. EDT: A user by the name of Tamerlan Tsarnaev has posted a video to his YouTube playlist extolling an extremist religious prophecy associated with Al Qaeda. It is not clear yet whether the user is the same Tsarnaev as the deceased bombing suspect. UPDATE 12: Friday, April 19, 6:37 a.m. EDT: NBC and the Associated Press report that the remaining suspect is Dzhokhar Tsarnaev, a 19-year-old resident of Cambridge. The deceased suspect, who was killed in a firefight with police this morning, is his 20 26-year old brother Tamerlan Tsarnaev. According to NBC, “both men had international ties, had been in the United States about a year and had military experience.” Meanwhile, much of the Boston area has been locked down—with schools closed and authorities asking businesses not to open—and thousands of police have been called in for a manhunt involving a door-to-door search in Watertown. UPDATE 9: Friday, April 19, 5:44 a.m. EDT: Boston Police Commissioner Ed Davis tweeted an image of what he said was “the latest picture of the suspect” in the Boston Marathon bombing around 5:40 a.m. Friday morning. It appears to be an image of suspect #2. Police told ABC News earlier that the image was taken by a security camera during a hold-up of a 7-11 in Cambridge. UPDATE 8: Friday, April 19, 4:32 a.m. EDT: Boston police confirmed in a press conference Friday morning that the explosions and gunfire Friday night in Cambridge, Boston, and Watertown, Massachusetts were connected to the Boston Marathon suspects whose photos were released Thursday afternoon. The suspect pictured in the black hat is reported dead, while the suspect with the white hat is reportedly still at large. Police have established a 20-block perimeter around where they believe the suspect is. Police are investigating a fatal shooting of MIT campus police officer by two men who then committed an armed carjacking in Cambridge, Middlesex Acting District Attorney MichaelPelgro, Cambridge Police Commissioner Robert Haas, and MIT Police Chief John DiFavaannounced this evening. UPDATE 7, Friday, April 19, 2:25 a.m. EDT: The FBI has just released two more photos of the suspects showing an “up close” view of their faces. UPDATE 6, Friday, April 19, 1:40 a.m. EDT: A police officer was shot and killed at MIT this evening. Another officer was wounded, a high-speed chase took place, and the local police scanner reports automatic weapons fire and grenades. One suspect has been taken into custody, the other is at large. It is not known whether this event is related to the Boston marathon bombings. We have more details on this incident in a separate post. The debate over the photo’s veracity ended when it was established he posted it on Facebook on Monday, long before the FBI released its cache of photos and videos. See a very large file of the photo here. UPDATE 4, Thursday, April 18, 10:30 p.m. EDT: Bloomberg has a major scoop: Jeff Bauman, the young runner who lost both his legs in the explosion and whose iconic photo has come to symbolize the tragedy, woke up in the hospital and helped ID the suspects.